An Old World native, long a garden favorite and occasionally escaping, though sometimes forming large clones in forests by extensive creeping rhizomes. First collected in Emmet Co. in 1964. 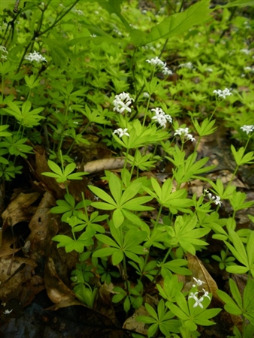 This species is widely cultivated as a shade tolerant ground cover and, especially in the past, for the scented foliage used to flavor May wine and sometimes other foods. The little lawn weed Sherardia might key here, if one did not recognize that genus by its elongate corolla tube and pink to blue flowers in little heads. See also notes under Galium sylvaticum. MICHIGAN FLORA ONLINE. A. A. Reznicek, E. G. Voss, & B. S. Walters. February 2011. University of Michigan. Web. 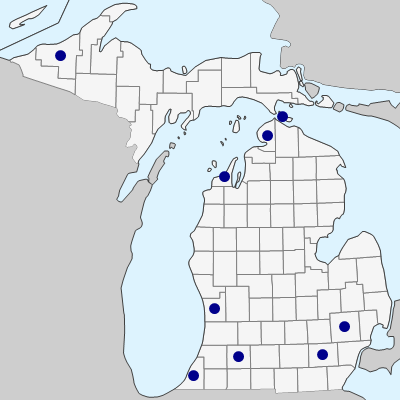 April 21, 2019. https://michiganflora.net/species.aspx?id=2591.